The proposal was first mentioned more than 1 and a half years ago, in FFF-191. Since then, we kept mentioning it in our blog posts and players kept asking about it. After a lot of back and forth within the team on whether we should implement it or not, and how it should work, we finally have it almost finished for 0.17. To refresh your memory: the quickbar is changed from being a separate inventory to simply a shortcut bar to the player's main inventory. It mostly works like the current quickbar, except item slots can only be filters. 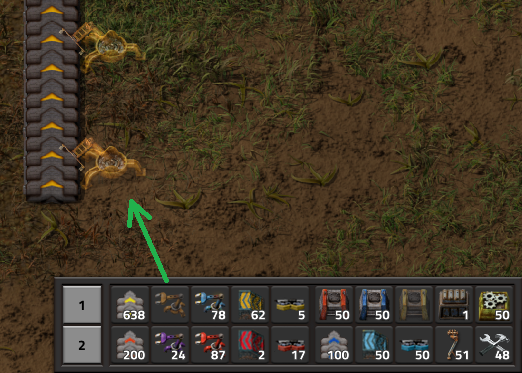 This means that when you place, for example, an Inserter in the new quickbar, it creates a shortcut telling you how many inserters of that type you have in your main inventory. Clicking the shortcut, will grab the first available stack from the inventory. That shortcut will stay there throughout the game, even if the inserters are depleted temporarily. No more random items appearing in the quickbar as you craft them. No more items moving to different slots when they get depleted and re-crafted. No more using the quickbar to carry things around. No more "will this be crafted to inventory or to the quickbar?". No more confusion when shift-clicking an item if it will go to the quickbar or the trash slots, or somewhere else. Guides the player to make proper shortcuts. Players are much more likely to remember shortcuts they created themselves. Player is in full control of the quickbar instead of the game trying to be 'smart'. Managing 1 inventory is simpler than managing 2 inventories. The main inventory size was increased by 20 stacks to compensate for the inventory slots that now became shortcuts. A suggestion that quickly gained traction was the ability to configure and switch between multiple pages of shortcuts, not just two. So the new quickbar is actually 10 pages of shortcuts that you can configure as you like: e.g. 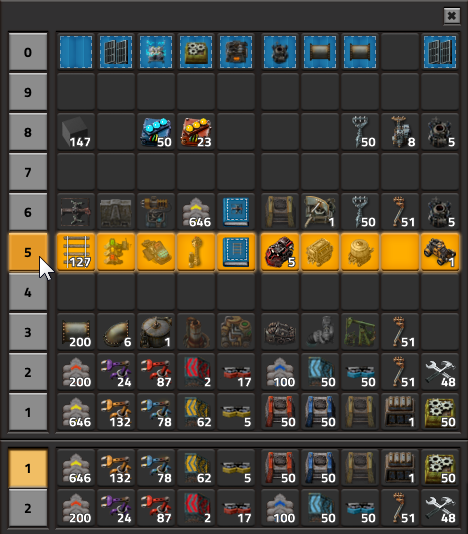 a page for general factory building, a page for combat, a page for building trains, a page for building outposts, a page for oil processing, a page with utility blueprints. It's up to the player to configure these pages as they like. When clicking on the button next to one of the selected pages, a page selector will open which shows all 10 pages of shortcuts. You can then easily select what page(s) you want to actively use and see on the main screen. The number of pages visible on the main screen is configurable. The page selector also acts as an extended quickbar, allowing you to quickly grab an item or blueprint that you don't commonly use, or allowing you to quickly configure your pages. The default keyboard shortcuts changed a bit: keys 1 to 0 will pick the item in the slots of the top selected page. Shift + 1 to Shift + 0 will change the the top selected page. So an advanced player will be able to quickly swap pages to build what they want. A feature for more advanced players is the ghost cursor: When selecting a 'buildable' item from the quickbar or when using the pipette tool, if you have no items of that type in your inventory, a ghost will be placed in the cursor instead. It's a common situation where for example you build something and you run out of inserters. So instead of crafting more or running to the other side of the base to get more, you can place ghosts, continuing to focus on designing what you are building instead of being distracted. To avoid confusion for new players, this feature is off by default and can be turned on in the interface settings menu. This is still work in progress, since big changes are also coming to the blueprint library. The plan is that you will be able to create shortcuts for blueprints from the blueprint library. This means you can place your most commonly used blueprints and books in one of the shortcut pages and use them directly from the blueprint library without clogging your main inventory. The new fluid system (FFF-274) is almost complete, but it is yet to be merged into master. After internal testing we have been making efforts to tune the new behavior, specifically how throughput over distance and flow with different fluids works. The new Biters and Worms have been showcased already in previous blog posts (FFF-259, FFF-268), and the last puzzle piece is the new Spitters. Alongside a graphical update, we have also been experimenting with some functional changes to the enemies. We presented our most recent developments on the map generation in FFF-258. Since that post, there have been some further planned changes and improvements, specifically to the placement of tiles, biomes, trees, doodads, cliffs. It seems to always be the case, but $nextUpdate is going to be the biggest Factorio release so far. While some initial playtesting shows that most things are stable, we have yet to have our typical office-wide week/fortnight of playtesting and tweaking. Inevitably things that we need to solve will come up during this playtesting, so it would be unwise to release before it is complete. There are also over 50 unsorted bug reports in our forum, which we will need to sort through. Looking over what is left to be done, It is clear to me that the release won't be ready in January. When we are ready to release 0.17, its launch definitely won't be a surprise. We will announce the exact date in the FFF at least the week before. As always, let us know what your think on our forum.